Dermot Joseph MacSherry was born in Ireland about 1898. 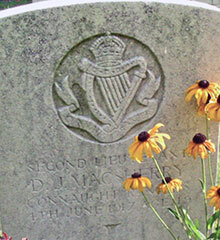 He was the only child of Thomas and Julia MacSherry. Dermot attended Stonyhurst College in Lancashire, England from 1911 to 1916. He was in the school's Officer Training Corps, before serving briefly in the Oxfordshire and Buckinghamshire Light Infantry. After officer training he was gazetted to the 3rd Connaught Rangers. As a newly-commissioned second lieutenant, he was sent to France in March 1917 to be attached to the 6th battalion. 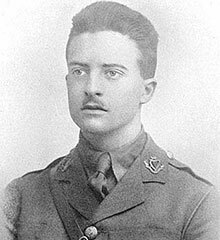 2nd Lieutenant Dermot Joseph MacSherry was was killed in action on 4th June 1917. La Laiterie Military Cemetery is located 7 Kms south of Ieper town centre on the Kemmelseweg (N331), connecting Ieper to Kemmel. From Ieper town centre the Kemmelseweg is reached via the Rijselsestraat, through the Lille Gate (Rijselpoort) and straight on towards Armentieres (N336). 900 metres after the crossroads is the right hand turning onto the Kemmelseweg made prominent by a level crossing. The cemetery is located on the right hand side of the road, 5 Kms after joining the Kemmelseweg.